There is a great deal to admire about LeBron James that has nothing whatsoever to do with his almost incomparable basketball gifts. Nothing to do with his business acumen, nothing to do with his moving his career from Cleveland to Los Angeles and nothing to do with his growing political presence. But has everything to do with his spiritual character. When James made the decision to open a school, not a camp, not a neighborhood center, but a school for children at risk and in great need, his spirit was leading him. James’ spirit firmly embraced his roots. He remembered going to school hungry, he remembered going to school in clothes that had not been washed, he remembered his mother needing work but unable to find any. And as he remembered those things, he remembered how there was little help for him and his mother. He then remembered that there are countless numbers of children who are going through what he went through. He became determined to help them and their families’ needs. The “I Promise School” is more that an education institution: it is a place where children who attend can come hungry but leave full mentally and physically. It is a school where uniforms are free, and where parents can get the help they need to find work or get their GED. It is a full-service education social agency. It is unique because poverty is a unique experience. How so? Because while a great number of us has been in poverty, the experiences of our poverty is singular and distinct to each of us. In other words, we all suffered differently. 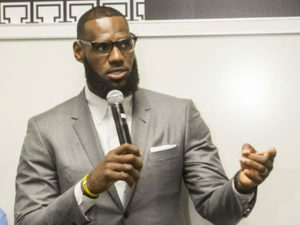 Only someone who has been homeless, hungry, ever in want like LeBron James has been, understands that poverty is about more than needing money. James, like a lot of our African American professional athletes, could keep making money and use it for himself and his family. But his spirit of childhood recall would not let him. He refused to be selfish. Just as his children were whole, he wants all children to be whole along with their families. We forget that there are children who spend the night hearing and watching domestic violence. Along with every imaginable kind of abuse. How can that child be expected to have a school mind the next morning? His/her mind is filled with the sounds and undeletable optics from the night before. James gets that and has responded in a way to those realities that almost guarantee a life change for those children in the most positive way possible. I hope the school will be successful beyond all expectation. Our comparison of the spirit of James to others only needs two people. One is the example Jesus Christ set. Jesus understood our lack of compassion for others. When He said the poor will always be with us, He was not declaring it so. It was just Christ acknowledging our emotional detachment to the poor. The other comparison is President Trump, who never met a moment that he didn’t want to turn into division and hatred.